The driver of the single decker bus was "shocked but not hurt"
One person has died and five others were injured when a bus taking on passengers at a shelter in West Sussex was hit by a second bus. 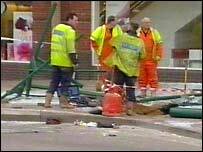 The crash happened at the western entrance to the County Mall shopping centre, in Crawley, at about 0915 GMT on Monday. Sussex Police said a double decker bus waiting at the bus stop in Friary Way was struck from behind by a single decker bus. Bus operators Metro said they were "devastated" by the crash. A police spokeswoman said: "A double-decker Metro bus was stationary at the station, taking passengers, when it was struck from behind by a single decker Metro bus, which then mounted the pavement. "In the process, it demolished the bus shelter and then struck the south-west corner of County Mall. "The group of people involved in the collision were getting on to the double decker at the time. An elderly man and woman suffered serious head, leg, neck and hip injuries and were taken to the East Surrey Hospital trauma unit in Redhill. Three others, who were less badly hurt, were taken to Crawley Hospital and are expected to be discharged later on Monday. A spokeswoman for Surrey and Sussex Healthcare Trust said: "Of the two seriously injured we are doing tests to establish the full extent of their injuries. "The condition of one is of concern while the other is serious but not life-threatening." 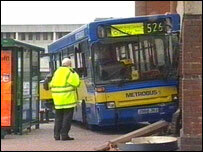 Gary Wood, operations director for Metro buses, said the crash was the company's first major incident. He said he understood the double decker bus which was struck was empty at the time of the collision and that those who were injured were waiting at a nearby bus stop. The driver of the single decker bus was shocked, Mr Wood said, but not hurt. He said: "As a company we are devastated by what has happened and our hearts go out to those who have been injured and to the family of the person who has died. "We have a very good safety record and this is the first such incident we have had, but we will be launching an internal inquiry as a matter of course once we have had all the police reports. "It is still too early to say exactly what happened. The emergency services are still at the scene and the area is still sealed off."